Today marks the anniversary of our beloved friend, the groundhog, making his appearance. Even more important is the issue of whether or not his shadow will make an appearance to said groundhog. We celebrated this most highly regarded occasion in Woodstock, IL. Woodstock was the location for the filming of the movie Groundhog Day. I rose at 4:20 am from my slumber to get a glimpse of the little weather predictor. It was well worth the effort I must admit. With heavy heart I must report that Woodstock Willie did see his shadow. I know, I know, but it isn't his fault. We must not blame Willie. We can only hope that next years prediction will not share the same fate. 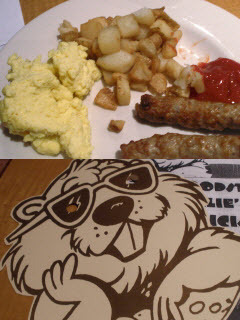 After the pomp and circumstance we joined our fellow Groundhog Day celebrators with a community breakfast. I pictured pancakes shaped like a groundhog. Not so. You can see from the photo that this was not the case. I tried to not be disturbed that sausages were served. Did any one ask what these were made of? Could it be...no of course not...they wouldn't...I mean the groundhog Willie's of the past just retire to a village or something right? Right?!!! He can't help it if we get 6 more weeks of winter! He is just a wee creature fulfilling a duty! Happy Groundhog Day to you and yours! !